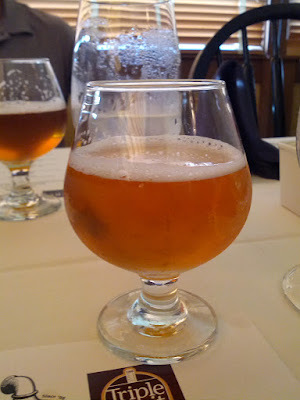 I was lucky enough to get invited to this beer dinner at Parker’s Blue Ash Tavern featuring the brews of Listermann and Triple Digit. Before we go any farther a bit of background on Listermann and Triple Digit. Listermanns has been a home brew store for a long time now then 5 years ago they started a small brewery aptly named Listermann Brewing Company. Wanting to experiment more they then created a separate brewery know as Triple Digit Brewing company, so named for all their beers having a original gravity in the triple digits. So they’re both brewed at the same place and on the same equipment but are “different” breweries. I’ve said it before and I’ll again repeat that I’m no food blogger but I’ll do what I can on that front. I will, however, be focusing on the brews and how well they pair with the courses. As for the restaurant I’d never been to Parker’s Blue Ash Tavern before but have seen how they’ve been improving their craft beer selection lately. I quickly checked on the way in and saw at least 8 taps of craft plus a standard sized color case full of craft bottles. paired with a Serpentine Wheat. Little bit darker than most wheats with much more orange color. Nice light aroma of wheat that reminds me of summer days. Very crisp taste with light citrus flavors, but not really the typical IPA type of citrus more lemony than that. Very light body and smooth mouth feel with plenty of carbonation bubbling across your tongue and almost no sense of alcohol. Super refreshing on a hot day. The heat from the Jalapeno meets up well with the cool soothing wheat but it’s was still a pretty hot dish… Or I’m getting old and losing my joy/tolerance of spicy food. Extremely light pale yellow, could be mistaken for a Bud Light. Strong flavors from the Belgian yeast strand brings out aromas of fruit. The flavor profile matches the aroma strongly of fruit and lots of grapes specifically. Uber light body and mild carbonation. Really flavorful beer showing off loads of fruit. The meal was infused with Leopold in multiple ways and tasted great with it. Orange brown color topped with slight head. Complex aroma mixing the bitter and sweet. Flavor hits you with a touch of bitterness then a wave of sweetness. Medium body and finish. I really enjoyed the flavor of this brew. Really awesome combo with the beer and food here. Fatty pork flavors of the meat were washed away by the IPA cleansing the palate for another bite. Dark brown mahogany color. Strong caramel and toasted bread aromas. Matching flavor with loads of alcohol, but not aggressive or in your face. Fuller body with a creamy mouth feel. Very enjoyable, but you should only do so with caution! Sorry, this food looked to delicious to wait to take a picture. Super awesome Ribeye, Asparagus, and fried Potatoes which goes great with this strong beer. Ingredients: 2 row pale, aromatic, crystal, Chocolate, flaked oat malts; brewers gold hops; American ale yeast. Very dark brown color. Nuts are all over the place here strong in the aroma and flavor. If you don’t like peanut butter you might want to stay away. I on the other hand love peanut butter and always say the world needs more porters, resulting in this beer being a great combo for me. Super delicious but almost a little too rich. Think about those vanilla wafer sandwiches, just in a peanut butter flavored and ultra gourmet version. Not getting down to Norwood (where the Listermann/Triple Digit brewery is) very often I have few chances to try these Listermann brews. Since Triple Digit is bottled and distributed more widely I’m much more familiar with their line up and have had Aftermath quite a few times. This is something that will have to change. I was seriously wowed by the Jungle Honey and need to get around to giving it a full review and making sure to get it more often. If you’ve been looking for an excuse to do the same then this Saturday is that excuse, especially if you like hazelnuts! From 10 am – 10 pm it’s officially Chickow! Day at the brewery, featuring a release of Bourbon Barrel Chickow! as well as many different variations on tap and cask. I also hear it’ll be easier to acquire a variety of Triple Digit in the future as they’re getting a bottling line (they’ve been hand bottling everything) and will be releasing 4 and 6-packs as well as the 22 oz bombers they currently carry! FULL DISCLOSURE: I was invited to this event by a PR firm and my meal was comped, so all food and beer were free. To our readers, and any breweries interested in inviting me to events, giving me free beer impacts the review in only 2 ways. 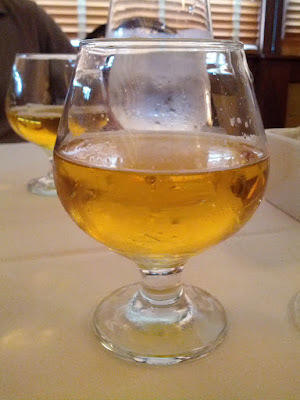 That way is that I WILL review the beer and I WILL write a blog post about it. Giving me free beer does not guarantee you a favorable review or that I will tell everyone to go buy it or anything like that. 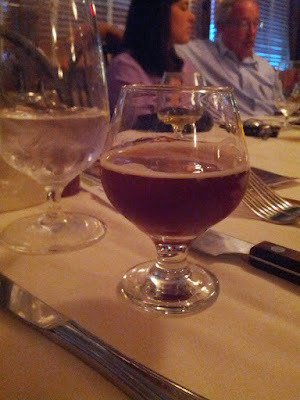 I just received information on a beer dinner featuring Listermann beers at Parkers Blue Ash. I really hope to make this one, as Listermann/Triple Digit have been cranking out some solid beers and the food pairings sound fantastic. 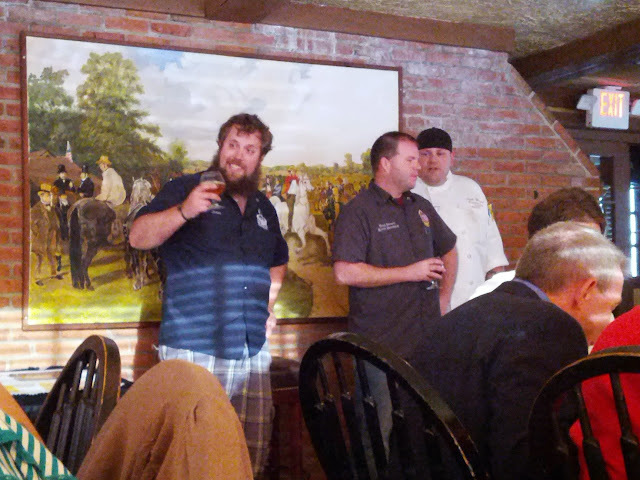 Parkers Blue Ash Tavern Executive Chef Josh House is hosting a Craft Beer Dinner in partnership with Listermann and Triple Digit Breweries on May 15, 2013. 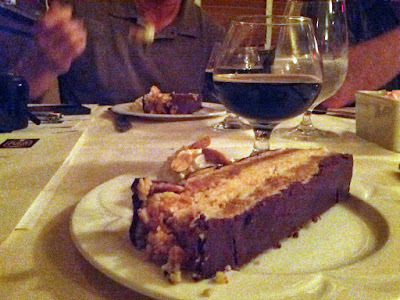 The dinner will take place during National Craft Beer Week, which runs May 13-19, 2013. This celebration, coordinated by the Craft Beer Program, is an opportunity for craft brewers to commemorate their art and tradition with enthusiasts across the country. Courses will include First Course: Tuna Tacos (Cucumber Salsa, Jalapeno Crema, Cilantro) with Serpentine Wheat; Second Course: Fish and Chips (Battered Pacific Cod, Crispy Plantain, Napa Cabbage) with Leopold; Third Course: Beer Belly and Pork Rinds (Smoked Pork Belly, Spicy Pork Rinds, Avocado) with Jungle Honey; Entrée Course: Ohio Steak and Potatoes (Ribeye Two Ways, Asparagus, Roasted Beef Jus) with Aftermath; Dessert Course: “Nutty Bars” (Fresh Peanut Butter, Wafers, Chocolate) with Nutcase. Reservations can be secured by calling Parkers at (513) 891-8300; limited space with capacity at 40. Tickets are $40 apiece. Additionally, Parkers is currently featuring one newly offered craft beer per week as the “Brew of the Week,” intended to encourage new and returning guests to broaden their horizons and try something different. Parkers Head Chef Josh House plans to keep each “Brew of the Week” in mind as he crafts specials each week to be paired with the wide range in craft beers available. The first “Brew of the Week” was the Triple Digit Chickow Hazelnut Double Brown Ale, only available locally by the Triple Digit Brewing Company on Dana Avenue. About Parkers Blue Ash Tavern’s Chef Josh House: Chef House hails from Miamisburg, Ohio where he began his culinary journey making pizza and washing dishes. He brings with him an extensive background of fine dining, banquet, and hotel experience from Louisville, Phoenix, and Cincinnati. Prior to joining the Parkers team, House was the Executive Chef at the Cincinnati Marriott Northeast where he helped design and implement new menus for the hotels’ restaurant and banquet departments. Before leading the culinary department at the Marriott, House worked at The Oakroom at The Seelbach Hilton Hotel in Louisville, Kentucky’s only AAA 5 Diamond Award winning restaurant, helping design a seasonal menu reflecting the desire of the team to push the boundaries of the local dining scene. While at Kai Restaurant at The Sheraton Wild Horse Pass Resort and Spa in Phoenix, AAA 5 Diamond and Forbes 5 Star Award winning restaurant, House began his education in southwestern cuisine with a focus on Native American ingredients indigenous to the area. House also spent time during culinary school working at The Seelbach Hilton Hotel as a banquet cook learning how to execute high volume banquets and writing the weekly brunch menu for The Oakroom before heading off to Arizona to help broaden his culinary knowledge. House looks to seasonal and locally sourced products when creating menu items or specials for Parkers and its award winning brunch, wine and beer dinners, and holiday menu offerings. About Parkers Blue Ash Tavern: Parkers Blue Ash Tavern is located at 4200 Cooper Road in Blue Ash. They specialize in All-American Fare with a wide selection of beef and seafood dishes, as well as a critically-acclaimed Best of Cincinnati Sunday brunch. 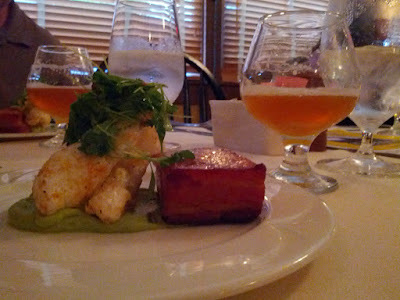 Additionally, they recently remodeled their Tap Room and patio and also offer a main dining room or private dining. The restaurant is known for its wood-burning fireplaces and charming equestrian theme.